If you're a photovoltaic module startup that has received venture capital funding in the last few years -- it's time to start showing results. The solar market is no longer the domain of scientists and hobbyists -- the industry will ship more than ten gigawatts this year. It's about scaling big, scaling fast and driving down costs. Suntech, Yingli, Trina Solar, First Solar, SunPower and others are all going to exceed one- or two-gigawatt-capacity levels in the next year or two (if they haven't already) and are scrubbing cost out of every process step. If you're not able to play in this league, why bother showing up? Striding into this bloodily competitive landscape are the scores of solar module companies hatched by investors in the last ten years. Solexant is one of the more interesting of them, and I just spoke with the CEO, Damoder Reddy. The fifty-employee firm recently raised Round C funding from Olympus Capital Partners, DBL Investors, Brichmere Ventures, Trident Capital, Firelake Capital and Medley Partners. An SEC filing shows that they closed $41.5 million of a $64-million-dollar round. Reddy said that Solexant synthesizes "semiconducting nanoparticles" on a "scale never done before." 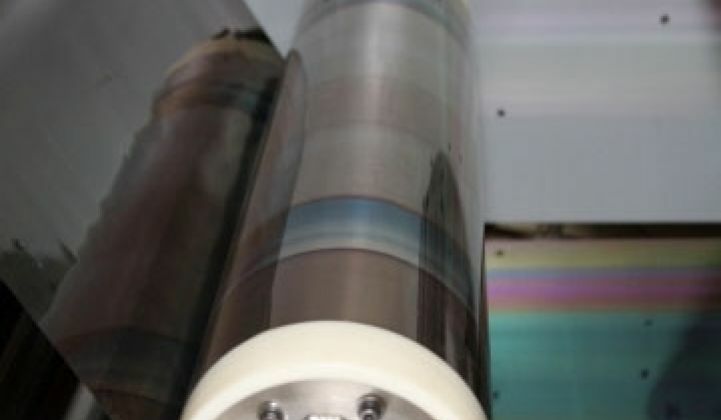 The nanoparticles are applied to a flexible metal foil substrate using an ink-type solution, and although the current photovoltaic material is cadmium telluride, the process is materials-agnostic. Roll-to-roll coating is a 50-year-old technology according to the CEO, and "the secret sauce is in the ink." Solexant's panels are lighter since they use a single sheet of glass, rather than the typical 'glass sandwich.' Efficiencies are expected to be in the 11-percent range. The company plans to commercialize solar cells based on other higher efficiency printed nanocrystal materials over the next few years. The goal is to find materials (other than silicon) that are "terawatt materials." Solexant was founded in 2006 by Dr. Damoder Reddy along with Prof. Paul Alivisatos of U.C. Berkeley, Prof. Paras Prasad of SUNY Buffalo and Prof. Sue Carter of U.C. Santa Cruz. (Paul Alivisatos inherited DOE Secretary Steve Chu’s old job in running LBNL.) Solexant's CFO, James McNicholas, VP of Engineering Craig Leidholm, and VP of Product Development Paul Adriani all served at Nanosolar prior to joining Solexant. The firm had previously raised more than $20 million in venture funding. On a recent panel, the CEO claimed that Solexant endeavors not to depend on government subsidies to be competitive, and that the company is targeting a fifty-cent-per-watt cost and a sales price of one dollar per watt. California seems to gestate firms like Solexant, Twin Creeks, and MiaSole, but cannot offer them the incentives necessary to convince them to stay. According to Oregon Live, "Damoder Reddy, chief executive of Solexant, confirmed...that the San Jose company plans a solar plant in the Portland area." Solexant is seeking a $25 million loan from the state of Oregon to finance a solar-cell plant that could grow from 100 megawatts to 400 megawatts of annual module manufacturing capacity. Here's another article on the Oregon move. The CEO understands the scaling challenges, saying "If we stay at 100 megawatts -- that's not even enough to be taken seriously." When asked, "Why Oregon?" for the next manufacturing site, Reddy said that this was "a topic close to his heart." The CEO spoke of spending a lot of time in the last 18 months travelling to Sacramento and getting a tepid response from California lawmakers. Yet when he traveled to Ohio or Michigan or Oregon, politicians and senators were willing to give Reddy time and try to figure out ways to get the firm to relocate to their state. Not so in California. In the CEO's words, "There's something fundamentally wrong in the way California does business." The firm expects to spend $40 million in capital expenditures and Oregon made the winning overtures in their effort to build a solar manufacturing hub in the state. Reddy seemed to want to keep the firm in California, but said, "I had to do what was right for my company." The new Oregon factory will be about 100,000 square feet and will employ as many as 200 people.